Unfortunately, when you open the roll, you realize it's already full of crap. 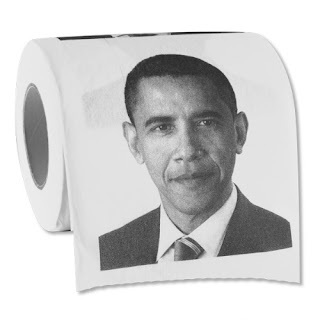 Worst toilet paper since the Brian Boitano edition, because as everybody know, Brian Boitano doesn't take crap from anybody. There is a woman in chicago that said obongo killed her son and 2 other guys, since they where ex boyfriends of obongo. Why use paper when the real thing wants to put his face back there? I haven't heard that. But then, nothing surprises me anymore. Of course, according to the new Harry Reid Rules of Evidence(TM), it's out there, you heard it, so it's true until BHO proves it's not.